If April is the cruellest month, then May is positively murderous when it comes to the social whirl of parties related to crime fiction. 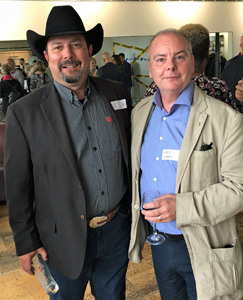 First out of the blocks was a splendid celebration of the crime output of publisher Head of Zeus in the fashionable penthouse restaurant of Waterstones in Piccadilly where Shots editor Mike ‘Tombstone’ Stotter got to meet a real cowboy in the shape of the charming and bestselling author C.J. Box. 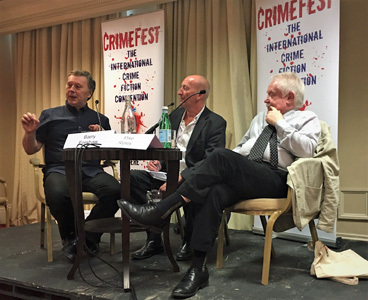 Chuck Box went on to prove that his western grit was true by attending CrimeFest in Bristol where he bravely joined a panel chaired by Professor Barry Forshaw. 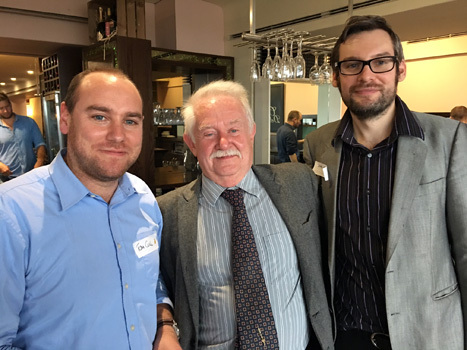 Meanwhile, I was put in charge of controlling the young hooligan element, namely the blogger and Ian Fleming expert Tom Cull and the incredibly Talented Mr Jake Kerridge (for contractual reasons I have to now refer to him as such) of the Daily Telegraph. With barely time to draw breath, I reported for duty at the famous University Women’s Club in Mayfair for the annual birthday party thrown by the Margery Allingham Society in honour of that most popular of the ‘Queens of the Golden Age’. Held slightly early because of CrimeFest commitments (her birthday is 20th May), the Society always hosts a guest speaker who has one important duty which is to cut the birthday cake. 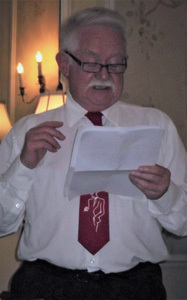 It was my honour this year to introduce the Society’s guest speaker – and cake-cutter – John Lawton who, despite my jibes at his reputation (totally false) as a bit of a curmudgeon, spoke elegantly on his discovery of the work of Margery Allingham and one of her creations in particular, the larger-than-life character of Magersfontein Lugg, who has featured – thinly disguised – in several of John’s own most excellent historical thrillers. He admitted he was a confirmed Luggite, and found himself in the company of many others. 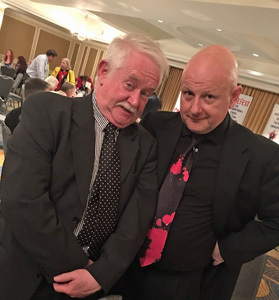 And then it was off into the west, to Bristol and the ninth CrimeFest convention, which culminated in an intensely intellectual debate between myself and Professor Barry Forshaw (chaired by the debonair Mr Peter Guttridge) about something or other. Well, it was Sunday morning and the last session of a very busy week. 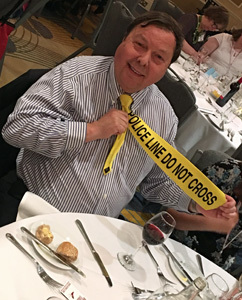 At the gala dinner on the previous evening, CrimeFest organiser Adrian Muller and I were discussing the merits of being two of the few gentlemen who still believed in wearing a collar and tie to formal functions, only to quickly find ourselves upstaged by Felix Francis and his flamboyant taste in stylish neckwear. 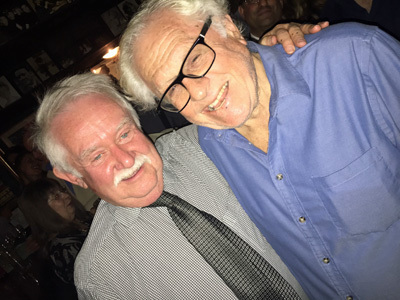 And then I was on duty at my own launch party, held in the legendary Gerrys club in darkest Soho, to mark the publication of Kiss Kiss Bang Bang, my homage to the adventure and spy thrillers I grew up with and some would say have never grown out of. The book is now splendidly published by HarperCollins and is available in good bookshops everywhere in time for Father’s Day. Taking time off from important matters of state, Prince Ali Karim flew in specially from his northern headquarters in order to take photographs of the event, including this natural, totally un-posed picture of myself with avid readers Kiwi Craig Sisterson and Ayo Onatade. Professor Forshaw was there of course, always willing to offer help and advice wherever needed, although I am pretty sure Ruth Dudley Edwards learned to read ages ago. Prince Ali also managed to snap distinguished critic Marcel Berlins, who honoured the event with his presence, on one of his rare excursions into Soho these days – at least beyond The French Pub. Taking my cue from an ancient television show which looked back to the news stories of a quarter of a century before, I have rummaged through my filing cabinet and turned up my Crime Guide column for the Daily Telegraph from 25 years ago. Originally published on 16th May 1992, it reflected what seemed to be a bumper month and featured some famous names. Topping the bill were the ‘ruthlessly well-written’ Sacrifice by Andrew Vachss, his fellow American Sara Paretsky’s latest case for V.I. 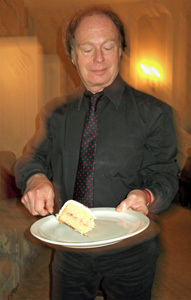 Warshawski Guardian Angel, and Britain’s John Harvey with his latest Charlie Resnick thriller Off Minor. There were also excellent offerings from Mark Timlin (Zip Gun Boogie), Val McDermid with her Manchester private eye Kate Brannigan in Dead Beat, veteran crime writer Margaret Yorke (Criminal Damage) and newcomer Veronica Stallwood (Deathspell) and also three new crime novels noted for their wit and sense of humour: M.J. Trow’s Lestrade and the Dead Man’s Hand, Alan Plater’s The Beiderbecke Connection and Walter Satterthwait’s fantastically clever Wilde West, which has Oscar Wilde playing detective whilst on a lecture tour of America in the 1880s supported by Doc Holliday, whose motives are always in doubt. I remember all those books with great fondness, especially Wilde West which I have recommended to scores of people over the years, so much so that at the last count I had to resort to buying my sixth copy. 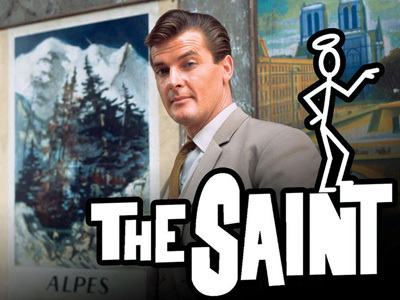 I was fortunate enough to meet and get to know all those writers I reviewed that May twenty-five years ago, although Margaret Yorke and Alan Plater (better known for his television scriptwriting) are sadly no longer with us. Of all the criticisms levelled against a contemporary thriller, undoubtedly the rarest is ‘this book isn’t long enough’, but I certainly felt that way whilst reading Lone Wolf by Michael Gregorio, published now by Severn House, the third adventure for Italian wildlife and forestry ranger Sebastiano Cangio. Set in the beautifully wild hills of Umbria (where the authors, a husband-and-wife team, are lucky enough to live) hero Cangio is employed looking after the wild wolf population whilst trying to avoid those two-legged wolves of the ’Ndrangheta – the Calabrian Mafia who are expanding their criminal empire into Umbria and, as we learn, even into the UK, leading to bodies (or bits of bodies) turning up everywhere, including near Stansted airport. Lone Wolf is a cracking thriller, written with great pace and an engaging cast of characters which includes a truly nasty villain and a wonderfully feisty female Captain of Carabiniere, which nicely contrasts rural Umbria with seedy London and which poses some intelligent questions about what will happen to cross-European crime-fighting as Britain plunges towards Brexit. I was happy to find that Troll by D. B. Thorne, out now from Corvus, was not the latest Scandinavian detective to invade these shores, but rather asuccinct and very gripping piece of noir involving the persecution of an already unstable young woman by a sadistic online troll. When the woman goes missing, her estranged father goes looking for her, refusing to accept the perceived wisdom of the police that she has almost certainly committed suicide. The father, who has his own problems, is called Fortune (with, its seems, no first name) which is perhaps not the best name for someone who works in a private bank based in Dubai and certainly not one which has just ‘lost’ several hundred million pounds. Mr Fortune – resisting the temptation to come across as Liam Neesom in Taken – is convinced his daughter is alive and being held against her will; and of course, he’s right. His investigation ricochets like a whizzing pinball as the troll (clearly some sort of twisted genius) seems to be always one step ahead. Even when the identity of the troll is discovered, he seems no nearer to finding and rescuing his daughter. As with all true noir fiction, you know this isn’t going to end happily and any suspension of disbelief required by the reader is gratefully granted thanks to the sheer pace of the narrative and you cannot but feel sorry for Fortune as he blunders about, up against a ruthless opponent. I was, naturally, aware of Francis Pryor’s work as an archaeologist but not, until now, as a crime writer. The Way, The Truth and the Dead is actually his second novel, published by Unbound, and features his protagonist Alan Cadbury – an archaeologist of course – in a mystery which begins in the East Anglian Fens, an area where Prior, wearing his non-fiction hat, has made some spectacular archaeological discoveries. Although it is not a crime novel, fans of the late Harry Keating will be intrigued by the posthumous discovery and publication of A Kind of Light, which appeared as an audiobook last year but is now available as an eBook and in printed form from Endeavour Ink. Written in 1987, but never submitted for publication, A Kind of Light is Harry’s homage to Joseph Conrad, a writer he much admired. It follows twin narrative strands – a female Victorian explorer searching the African jungle for a miraculous medicinal plant and a modern day film crew attempting to recreate and record her expedition. Those who now only remember the name H.R.F. Keating in connection with Inspector Ghote of Bombay’s CID should take the opportunity to discover what a versatile and intelligent novelist he was. It may be tempting fate, or a case of famous last words, but in either case I doubt Gyles Brandreth is the sort of writer to worry about epithets (or reviews) like that, for he has emphatically titled his new novel Jack The Ripper Case Closed, published by Corsair. Solving the most famous of unsolved murders falls to none other than the dynamic duo of Oscar Wilde and Arthur Conan Doyle, both of whom have considerable experience as fictional detectives. 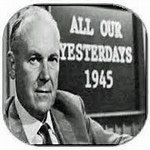 Gyles Brandreth has employed Wilde as a detective in six previous novels – just as Walter Satterthwait did in Wilde West twenty-five years ago (see ‘All Our yesterdays’). Interestingly, Satterthwait also went on to have Conan Doyle as a fictional detective – teamed with Harry Houdini no less – in Escapade in 1995, a novel not previously published in the UK until later this year. Clearly Brandreth knows his Oscar Wilde backwards and he seems to know his Conan Doyle, but could this really be the last fictional word on the Ripper case? Somehow I doubt it. I have to admit to being slightly bemused by what I think is a first novel by James Hazel, The Mayfly, a paperback original from Zaffre. The author (it says here) is a former lawyer who has a passion for ‘indie music and all things retro’, characteristics he certainly seems to have passed on to his hero, Charlie Priest, a former police detective turned London lawyer, if being ‘retro’ mean the inability to cook a simple piece of fish, for as we first meet Charlie, he is throwing his third ruined lemon sole of the evening into the kitchen bin. Now this surely is a ‘retro’ reference. Not only the use of the word ‘Tommy’ to describe a British soldier – which would have been pretty retro even in 1946 – but having them armed with machine-guns manufactured in the years 1912-1925 and more commonly used in trench warfare in WWI than carried by sentries in 1946, is the clincher. ‘Retro’ in the best sense of the word could be applied to Graham Hurley’s new novel Aurore, from Head of Zeus, as it is set mostly in 1943, but to be more accurate I shall call an outstanding historical thriller. 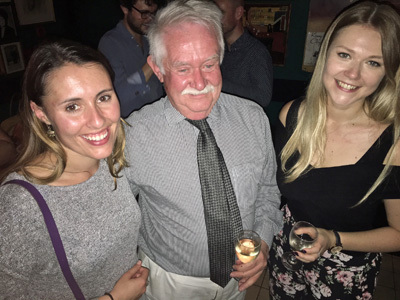 After successful series of police-based crime novels set in the west country, Graham Hurley has hopped the Channel (as, ironically, has some of his crime writing which has been successfully adapted for French television) for WWII adventures set in Europe. Aurore is a companion piece to his highly-regarded Finisterre last year. This time the setting is the Touraine region of France and a complex plot of bluff and double bluff aimed at planting fake intelligence about the plans for the D-Day invasion. 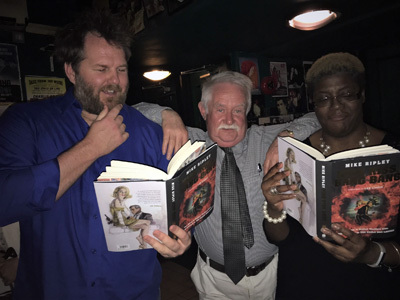 Sadly, it was an overcrowded social diary (rather than the usual legal reasons) which kept me from attending the launch of Amnesia, newly published by Corvus, though I sent along a message of good cheer as I had been fortunate enough to read an early copy. Not surprisingly the novel is about amnesia. An elderly man living in the remote Scottish Highlands has a fall, is admitted to hospital and wakes up with selective amnesia. He might remember where the light switch is in his cottage, but could he have blanked out killing the only woman he ever loved? The truth is sought through the questions of a young woman reluctantly pressed into service as his carer and through the pages of a novel, perhaps biographical, set in pre-war France. A consummate and very satisfying piece of storytelling. I did not realise that in a twenty-year career as a bestselling crime writer, we have had to wait until now for Kathy Reichs’ first ever stand-alone thriller, Two Nights which is published by Heinemann later this this month, or possibly early next month, I am afraid I am not sure. Introducing a new character, private eye Sunnie Night, a heroine who favours, shall we say, a more direct approach to investigations rather than the more scientific, forensic approach of Temperance Brennan – an immensely popular, but surely one of the most unfortunately-named protagonists in mystery fiction. The oath I took on joining the Royal Order of Rechabites and Curmudgeons (of which the Grand Vizier is John Lawton) impels me to mention a crime novel published in English for the first time by a Swiss-Canadian, if for no other reason than I cannot ever remember seeing a novel by a Swiss Canadian before, let alone one set in Boston. There was much talk at the recent CrimeFest about what was ‘noir’ and what constituted a ‘thriller’, especially the ‘adventure thriller’ (if I may callit that) which was long seen, and perhaps still is, as a genre reserved for male writers and readers. Such contentions and myths are meant to be challenged and right on cue, a challenger, Jack Ford, arrives with the publication late this month of The Killing Grounds from the HQ imprint of HarperCollins. Described as ‘an action-packed, fast-paced, gripping and topical story’ which starts with a preamble in pirate-infested Somali waters, but rapidly moving into political skull-duggery and violence in the Congo, the book introduces ex-US military hero Thomas J. Cooper, now working as a high-asset ‘recovery investigator’ in what is already planned as a series. 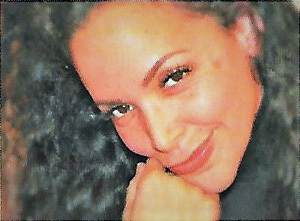 The ‘challenge’ to this male-dominated genre comes in the fact that ‘Jack’ is actually shorthand for Jacqueline Ford. 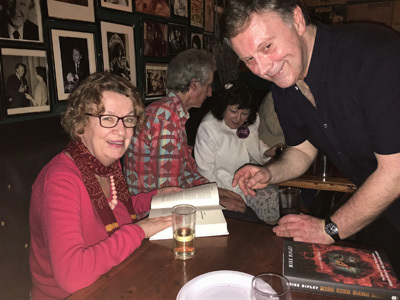 I am delighted to hear that Stella Duffy has inherited the mantle of Dame Ngaio Marsh (1895-1928) and accepted the daunting challenge of completing a novel abandoned by Dame Ngaio in the 1940s after only three sketchy chapters. Money in the Morgue, which I believe has been commissioned by HarperCollins and sanctioned by the Marsh estate, will see the return of another ‘Golden Age’ fictional detective, Roderick Alleyn, and I can honestly think of no-one better to welcome him back. 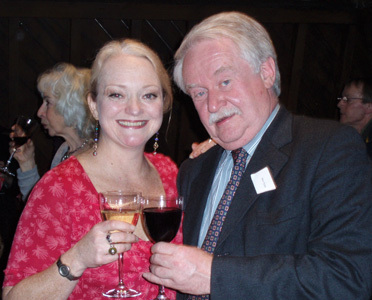 Not only is Stella Duffy an experienced crime writer, but she is also an irritatingly talented dramatist and actor and has a background in New Zealand, Marsh’s home country. To prove her credentials – though she has absolutely no need to – Stella has contributed the Introduction to the Collins Crime Club ‘Detective Club’ reissue next month of The Nursing Home Murder, first published in 1935. 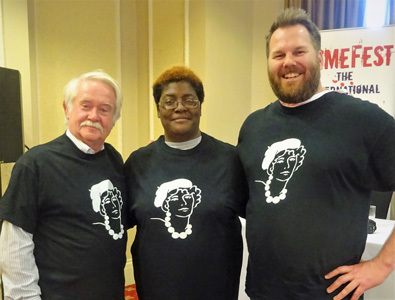 Such is the respect shown Dame Ngaio in New Zealand that when ‘Kiwi’ Craig Sisterson established the first ever national award for crime writing some years ago, it was only logical that it would become the Ngaio Marsh Award and her image is the award’s logo – as seen on the t-shirts presented to those honoured to be asked to be on the annual judging panel. As Roderick Alleyn is set to take his place among contemporaries such as Hercule Poirot, Lord Peter Wimsey and Albert Campion in ‘continuation fiction’, an even older fictional hero is due to reappear after an absence of more than 80 years: John Buchan’s Richard Hannay. The famous ‘clubland hero’ of The 39 Steps and other ripping yarns, makes a comeback in The Thirty-One Kings by Robert J. Harris (no, not that one) in October and apart from the fact that the book is set in 1940 and published by Polygon in Scotland, I know little about it, but I am intrigued. 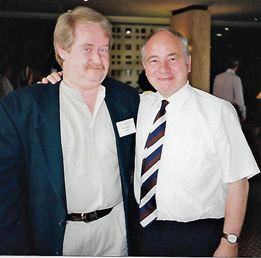 As it is the season of crime fiction conventions and festivals, I use that as an excuse to revive this picture from a convention in Nottingham more than 21 years ago of my old friend Colin Dexter. I am prompted to do so after receiving news that the good citizens of Oxford are planning to erect a statue to Colin, who passed away earlier this year. I have to admit that my first reaction to one of Dean Street Press’ recent reissues of a ‘Golden Age’ author of detective stories, was not one the publishers were probably aiming for. 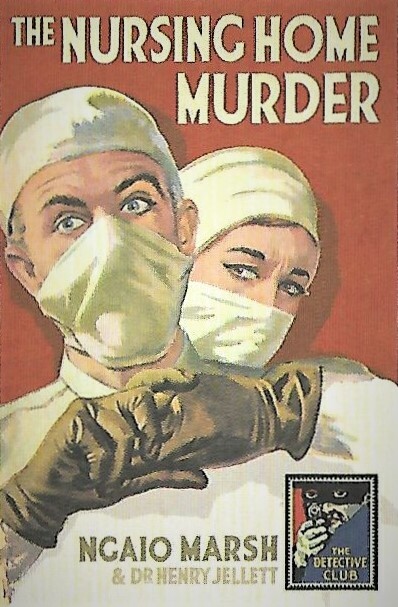 Dean Street’s latest set of attractive paperbacks feature the six novels written by Peter Drax (no, me neither) between 1936 and 1939 and the second in the series, He Shot To Kill caught my eye instantly. The author, whose real name was Eric Addis (1899-1941) was a barrister and then naval officer, killed in action during WWII, and his crime novels were, apparently, noted for their realistic approach to police work, but I was unaware of that and was transfixed by the numerals printed on the bottom right of the cover announcing 2/6 – which I thought was a jolly reasonable price for a modern paperback edition. It refers, of course, to He Shot To Kill being the 2nd book in the series of 6 and not to a pre-decimal pricing structure. And yes, once I realised, I did feel old.